I am so excited to have Mandy over here today! We have become friends through the blogging world and I always love all of the fabulous food that she posts on her site! She just had an adorable new baby boy. Mandy is just the cutest thing ever, even when she is 9 months preggo! I am so glad she is sharing this yummy copycat recipe and I am excited to make it as a side to our next meal! Hello! I am Mandy from Mandy’s Recipe Box. I am super excited to be guest blogging today for Alyssa while she and her hubby are on a fabulous cruise. I hope you’re having a blast, Alyssa! I first “met” Alyssa when I saw her mouthwatering recipes that she was linking up on my link party, “Totally Tasty Tuesdays”. I have been a huge fan of hers ever since. Like her Pannukkau or Slow Cooker Chicken Cordon Bleu? Yum. I love all things food. Food Network, cooking magazines, cookbooks (I love them just like I love novels), and of course eating! I also love Copycat recipes. It’s great to be able to recreate my favorite dishes from restaurants at home to save money. Today I am sharing KFC’s Coleslaw. It really tastes just like the real thing. My husband loves their coleslaw and now I think he loves me a little bit more for being able to make it for him anytime he wants. Combine the cabbage and carrots in a large bowl. Or open the bags and dump them in a large bowl. Combine the dressing ingredients and whisk well in a small bowl or use a jar to shake them up. Pour over the cabbage mixture and refrigerate till chilled. Or you could make the dressing first and let sit in the fridge till chilled then pour over the cabbage mix and serve. I hope you enjoy this recipe! Please come visit me on Facebook, Pinterest or Instagram. This sounds so good! Pinning this for family BBQs this summer! Yummy!!! 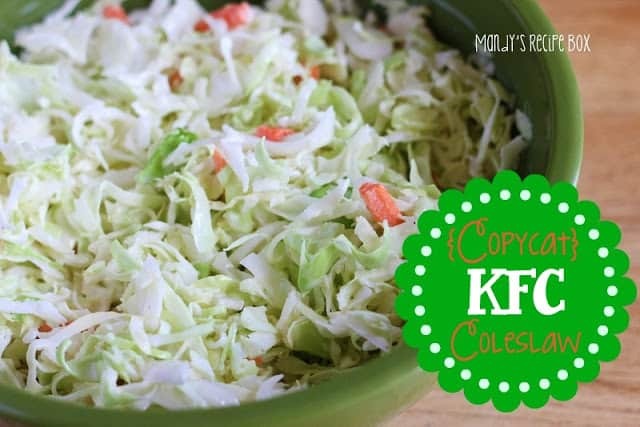 I love coleslaw can’t wait to give this a try KFC has the best coleslaw. Thank you for sharing.